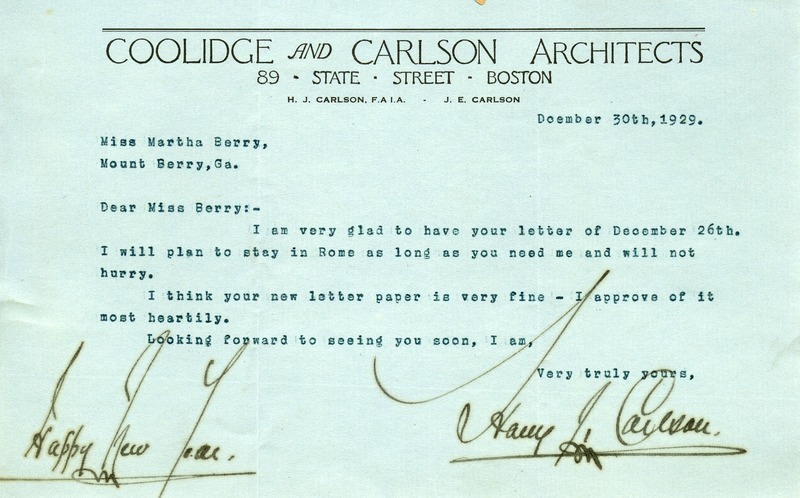 Architect Harry J. Carlson writes that he will plan to stay in Rome as long as he is needed and compliments Martha Berry on her new stationery. Harry J. Carlson, “Letter from Harry J. Carlson to Martha Berry.” Martha Berry Digital Archive. Eds. Schlitz, Stephanie A., Sherre Harrington, Chelsea Risley, et al. Mount Berry: Berry College, 2012. accessed April 26, 2019, https://mbda.berry.edu/items/show/9723.